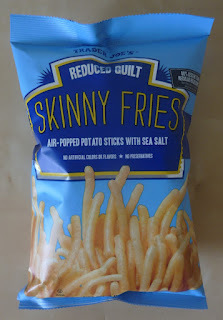 They're called "skinny" fries, perhaps not because they are skinnier than fast food French fries in size and shape, but presumably because they will make you skinnier if you choose them over fast food French fries. They're crispity and crunchity, and their flavor is vaguely reminiscent of an actual fry, but unfortunately, they taste like a reduced-guilt option. They're very light. Not only low in calories, but each individual fry seems to carry no mass—as if they would float out of your hand if prompted to do so by the subtlest breeze. Although, paradoxically, there does seem to be a fine oily residue on each fry. They taste a bit like natural potato, and they taste a bit like vegetable oil. They're lightly seasoned with sea salt, and they do contain some wheat flour, but I must say I couldn't really taste it. If you're looking for something along the same lines, but actually want a bit more flavor, we recommend Trader Joe's Veggie Sticks. Not quite as light, but they're certainly not going to give you a heart attack—at least not by themselves. The Veggie Sticks are extremely similar to these Skinny Fries in taste and texture, but the Skinny Fries fall just a bit short in each category, especially flavor. Honestly, if I were going to choose a light, fluffy snack, and it had to be on the bland side, I'd probably choose a rice cake over these Skinny Fries. If I wanted something in the direction of an actual French fry, I'd go get some actual French fries (Trader Joe's has multiple oven-ready varieties). And if I were looking for some potato-crisp, fry-esque noshables, I'd go with the aforementioned Veggie Sticks. 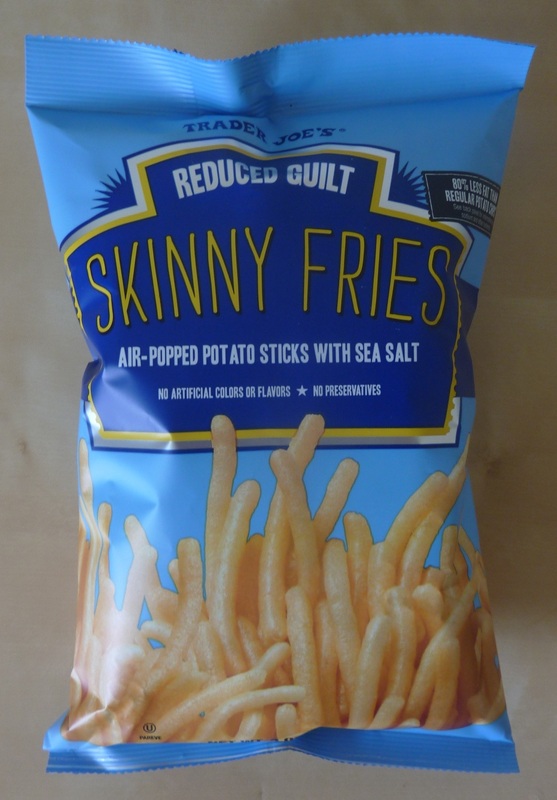 I just can't see us ever having occasion to buy these Skinny Fries again. They're not bad, but there are just too many better alternatives out there, in my opinion. Maybe if you're a fan of the Veggie Sticks, but want to shave a few more calories off of your afternoon snack, these might be for you. We don't want to beat them down too hard, but we also can't muster a lot of enthusiasm for them. Sonia gives them 3 stars. I give them 2.5. Bottom line: 5.5 out of 10 stars. I thought those were SO gross. Those had a bizarre texture and, there was a deformed multi-fry in my bag that was hard as a rock. A bad experience overall. I think the flavor is mega funky too. I agree with you, the veggie sticks are great and I also highly recommend the popped potato chips (I think there are 10 more calories per serving).